Map showing my route. Blue is the ascent, red the descent. 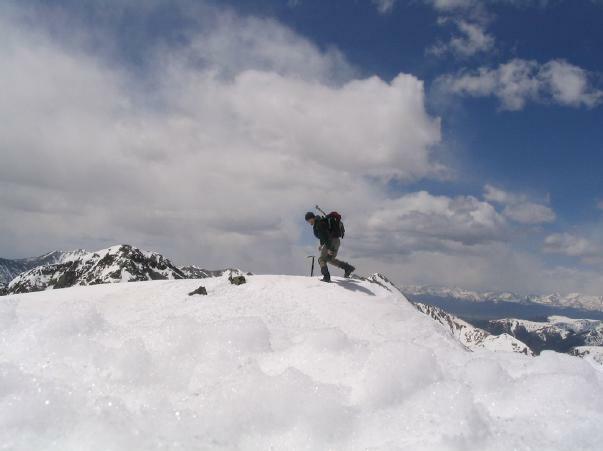 Pacific Peak is a beautiful high-13er in the Tenmile Range of Colorado. 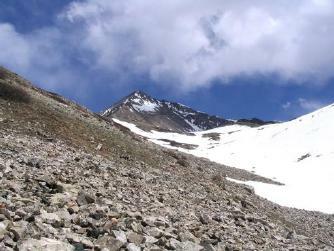 At just 50 feet shy of the magical 14,000' mark, it receives none of the attention and few of the visitors it deserves. Yet from below, including many spots along the road, Pacific appears as a mighty, black pyramid of startling proportions. Visually, it is one of the most pleasing peaks in the area. 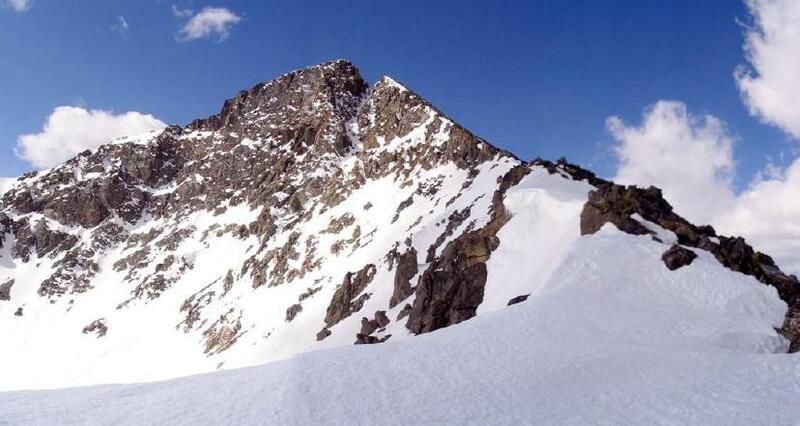 Atlantic Peak is slightly shorter (13,841') and lies just under a mile to the south of Pacific. Together, they provide an entertaining and grandly-named traverse known as the Pacific to Atlantic Route. Think Lewis and Clarke, only with less time commitment and fewer canoes. In March, Nathan Smith and I attempted Pacific via the North Ridge but were rebuffed down in the valley by the surfeit of snow which had recently fallen. 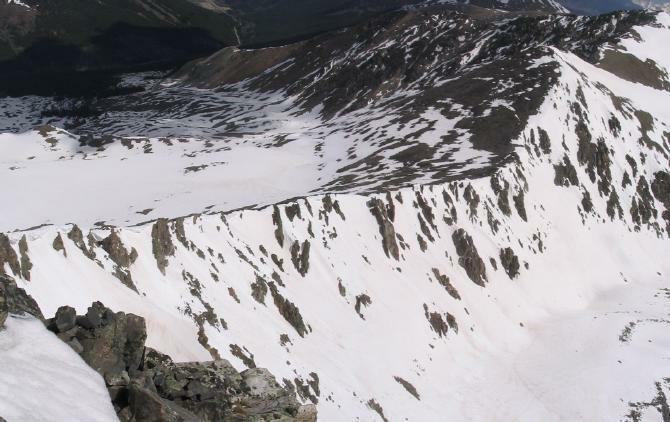 Instead, we wandered around in the beautiful Mayflower Gulch valley formed by the south face of Atlantic, the west face of Fletcher Mountain, and the jagged ridge between the two. With spring well-begun and summer ramping up, I figured it was time for a rematch while there was still some snow to make things interesting. Lacking hiking partners for the weekend, I left town solo at 4:30 am and arrived at the Mayflower Gulch trailhead a little after 6. Indeed, things had changed quite a bit in the two months since my last visit. There was still snow up on the mountains, but the trailhead was clear. Last time, we'd been hampered by the willows which fill the valley. I was also concerned about crossing the Mayflower Creek which was definitely up and running this season. I drove a tenth of a mile up the 4wd road and parked at a turnoff. From here, I could cross the creek on a flow control barrier and avoid the willows and creek entirely. Pikas. Noisy little suckers, aren't they? It was a little chilly starting off, but I quickly warmed. Opting for altitude early, I headed north from the faint trail on the left side of the valley and ascended very steep grass up the side of Mayflower Hill. I quickly broke out of the trees and could see the jagged peaks of Drift and Fletcher to the east catching the first rays of the rising sun. The slope was more gradual now, but I still huffed and puffed crossing remaining patches of snow. At length, I gained the ridgeline of Mayflower Hill and discovered a steep cliff on the north side. The remains of a cornice spoke of the recent winter snows and I stayed well to the south of it. By 7:30, I reached the ill-defined summit and paused for a breakfast of Clifbar and Gatorade. Mmmm. From up here, I could see the remainder of my route: I'd drop down from Mayflower Hill to the east into the narrow drainage of Pacific Creek. Then, I'd head north on snowfields traversing below the massive northwest face of Pacific Peak. My goal was the saddle on the ridgeline between Pacific and Crystal Peak to the north. It was then a simple matter of climbing the ridge to the summit, descending the ridge to the saddle between Pacific and Atlantic, climbing the north slopes of Atlantic, and then descending back to the creek drainage via Atlantic's long, west ridge. No problem! 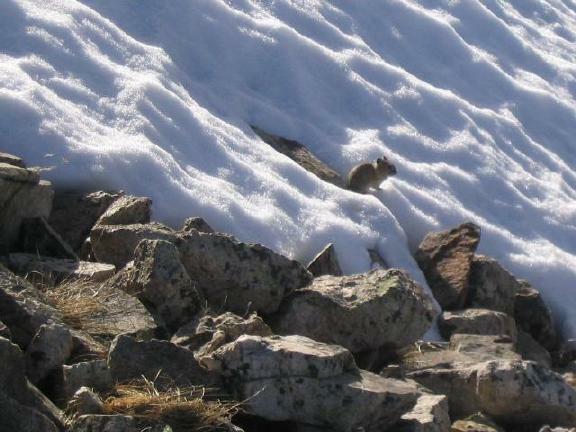 Feeling energized by the view and my recent caloric intake, I carefully descended the steep scree on Mayflower Hill's east face and surprised a pika. 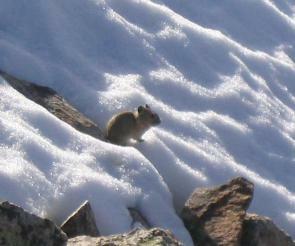 Pikas are easy to hear in alpine territory by their sharp, chirping calls. They're harder to see, however, and I was pleased to catch a couple photos of one emerging from his burrow in the snow ahead of me. Once in the drainage, I climbed higher again and was confronted with the traverse under the northwest face of Pacific. It was fully snowed and quite steep; fortunately, the snow was hard enough for walking on as I'd left the snowshoes in the car. Back in January, Amy and I had encountered a similar traverse with only hiking boots and poles and it was a very exciting time. This time I was much better prepared and swapped hiking poles for ice axe and donned my crampons. Awesome! The crampons made the footing trivially secure and my axe functioned as a reminder that I could self-arrest in the unlikely event of a slip. The traverse under the massive northwest face of Pacific. Crystal Peak in the sunlight in the distance. The traverse went easily and the sun finally appeared above the ridgeline warming me conciderably. There is no set trail up to the Crystal/Pacific saddle and I was enjoying my crampons so much, it seemed like a shame to take them off. Instead, I picked a nice steep 35-45 degree snow slope and headed up. Definitely hard work and I was forced to rest every dozen steps or so. Eventually, I emerged on the ridgeline having tread on snow most of the way up. The view of Crystal to the north and the deep, lake-strewn valley to the east were nice, but the view to the south was spectacular. Pacific loomed above steep, black and forboding with it's cleft summit and gently curving ridgeline. The awesome north face of Pacific with the North Ridge curving out to the right. I could stay on snow for a bit longer, but it looked like I'd be treading the top of an old cornice balanced over a few hundred feet of steep, jagged rocks. 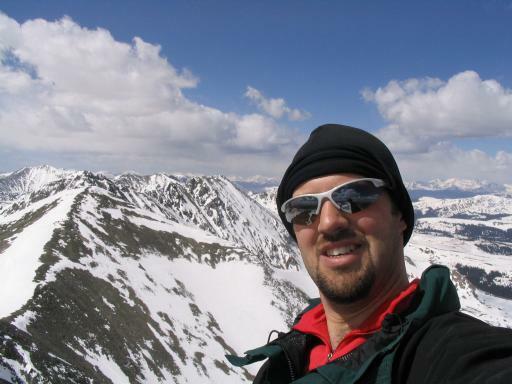 I took the harder but wiser route, doffing crampons, and stuck to the west on the tallus. A faint trail could be followed in many places and it was quick, strenuous going to climb steadily up the north ridge. Just as I began to feel seriously tired, I found myself under the western pinnacle of the summit. The ridge became uncomfortably steep at this point and I traversed right and up around the pinnacle. This led me to the top parts of the classic west ridge route and soon to the summit of the pinnacle itself. The actual summit was only a few dozen feet higher and not much farther away on the other side of a deep cleft. I scrambled down some loose, scary rock into the cleft and looked down the thrilling 5th-class couloir on the north face. Yow! My way on, however, was a fairly obvious climb up a shallow, sheltered chimney in grey and white rock (probably 3rd class) which deposited me suddenly on the actual summit. All alone on the top of the world. Atlantic Peak in the background. Looking down and north at Crystal Peak (far right) and the north ridge up which I had just ascended. Wow! Fantastic summit. Small, airy, and all mine! I let out a rebel whoop and relaxed for quite a while. The time was 10am and I felt unbelievably smug at my early morning accomplishments. After a short rest and some photos, I continued my trek. The south face of Pacific is much more gentle than the north or west ridges and was predominantly snow-covered. I managed to glissade most of the way down to Pacific Tarn (highest lake in North America, though still frozen), shooting video the whole way, and hiked the easy quarter mile over to the saddle with Atlantic. The north face of Atlantic as viewed from the saddle with Pacific. The long west ridge on the right was my descent route. The north ridge of Atlantic was similarly broad, and snow-covered though it became fairly steep and unrelenting toward the top. Crampons went back on for the climb though they probably weren't neccessary. I'd progress a hundred feet, stop, pant, hydrate, and look around, and then push on. My legs were on fire from the climb, the altitude, or not enough sleep. I could see Quandary Peak (another mountain with which I have a bone to pick) just to the southeast and tiny ants of perhaps a dozen people walking around on the summit. This was in marked contrast to Atlantic and company on which I had seen exactly two Pikas, one chipmunk, and no other mammals since leaving the car. This is certainly an accident of geography because an extra hundred feet of elevation doesn't transform the mountains into anything more extraordinary! With great relief, I emerged finally on the broad, snow-covered summit of Atlantic at 13,841'. It could not have been more different from Pacific; perhaps and acre of deep, drifted snow with the summit itself rather hard to accurately determine. I picked the highest looking mound of snow as the most likely spot. The time was a little after 11am and the snow was starting to get disconcertingly soft. I postholed a few times up to my hips and, after a series of photos, started the descent eager to get out of the sun and wind. Trying to get a timer photo on the summit. I tried three times and never quite made it. Oh well. The narrowest, most precarious part of the west ridge. There is a strong cross-wind and sharp drop-offs to either side at this point which made balance exciting. The west ridge of Atlantic forms the northern wall of the beautiful Mayflower Gulch. From below it appears quite rugged and rocky and I was not disappointed. 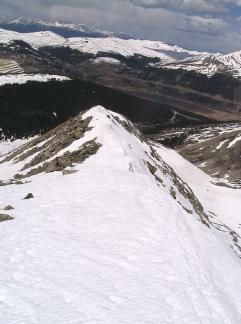 The ridge decends steeply with sharp drop-offs to either side; on the left (south) to sharp cliffs and jagged rocks; on the right (north) to smooth, steep snow slopes into the depths of the Pacific Creek cirque. Either option was unattractive and I stuck carefully to the increasingly narrow, precarious, and extremely windy ridgeline. Fortunately, it was largely snowed still but the frequent rock crossings made me decide against crampons. I nearly got in trouble at one point as I skirted a rocky bit by plunge-stepping down a shallow coulior on the south side. This coulior rapidly became steeper dropping out of sight below and the snow became hard enough that my heels weren't making much of an impression. Mildly terrified, I plunged my axe in to the head, kicked some toe holds, and gingerly traversed over the the rocks. Yikes! Perhaps I should have left the crampons on! The view of both Pacific and Atlantic from the west ridge is stupendous! Seemingly an interminable time later, whipped by strong crosswinds and becoming quite fatigued, I descended a steep rocky slope to a broad, snowy hump at the end of the ridge. I could see the creek drainage below and I planned to glissade down it's steep slope to the valley. I was faced with two obstacles: first the snow was now so soft I could barely walk without breaking through with every third step. Second, the slope dropped away so steeply to the north that I didn't feel comfortable simply sliding down and trusting to luck. After much slogging, I managed to get close enough to see the 50-degree slope all the way to the bottom and discover that no rocks waited to rend me limb from limb down there. I gratefully sat and slid wetly to the bottom. Back down in the Pacific Creek drainage, I gratefully switched back to non-snow mode. 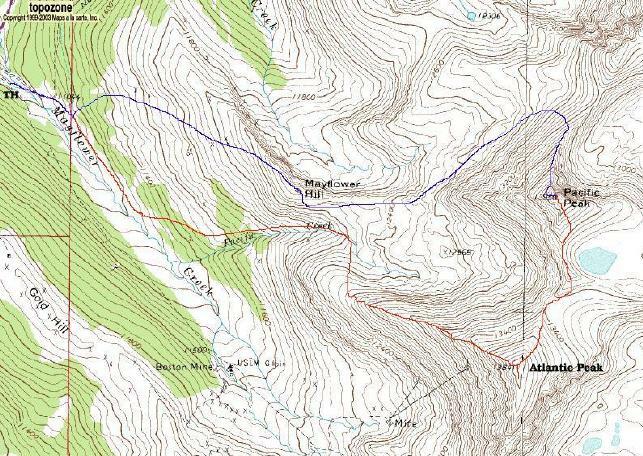 From here, it was a simple matter of hiking back out the drainage to the Mayflower Gulch and back to the car. The snow was quite soft at this point (1pm) and, though I would much rather travel on snow than sharp, loose tallus, I was forced to take the rocky road. I took a brief nap, enjoying the warm sun, switched back to hiking poles, and proceeded sorely across the tallus to the woodland below. 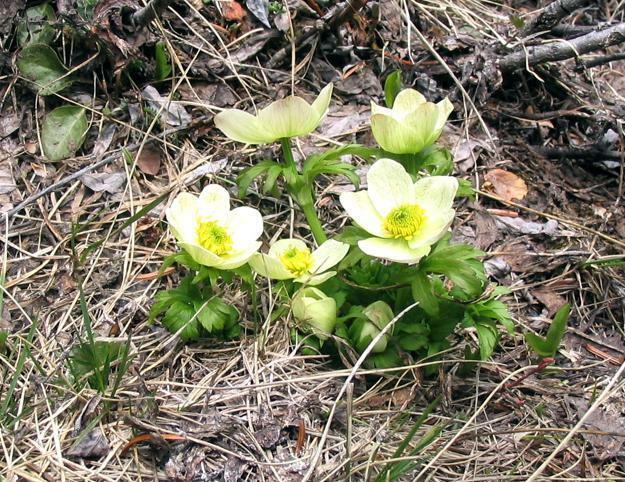 Birds sang and flew through the trees and the lower slopes of the aptly named Mayflower Hill were covered in May flowers. I reached the stream valley and turned west along the north edge of the willows on a rough trail. By 2pm, footsore and very tired, but pleased, I reached the car and gratefully surrendered to the luxuries of 21st century living. A fantastic solo trip; my first of any consequence out here in Colorado. This was the first time I'd really put my crampons and axe through their paces and I am quite impressed with the utility of both. Total mileage was about 7 miles in just under 8 hours (including naps) and I logged about 3900' of elevation gain. Definitely a hard workout, but a beautiful place to do it!